Here’s the writeup for your second to last assignment. This time, we’re taking off the “training wheels” and having you read a real paper, rather than course notes. Why? Because you’re ready for it! At this point you have all the fundamental knowledge you need to go out into the broader literature and start implementing all sorts of algorithms that are built on top of ideas from differential geometry. 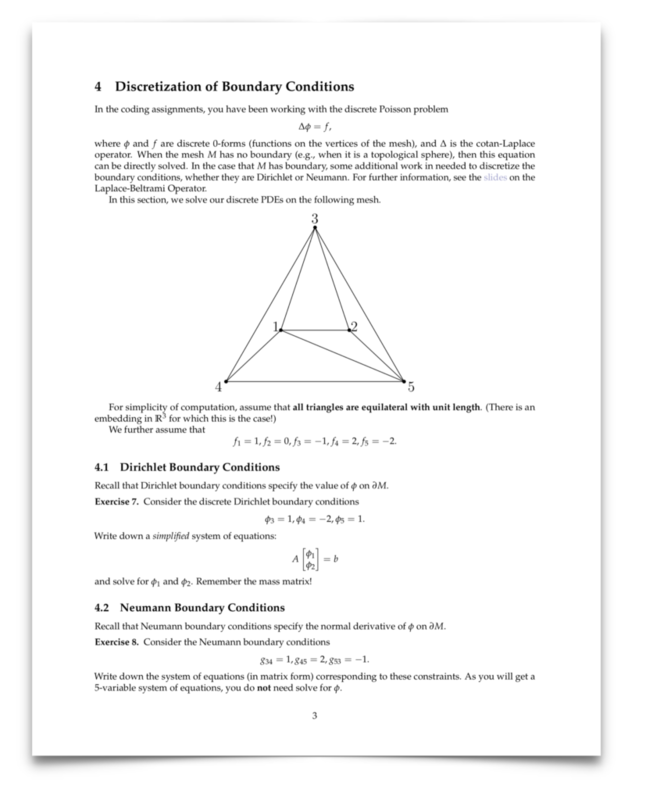 In fact, this particular algorithm is not much of a departure from things you’ve done already: solving simple equations involving the Laplacian on triangle meshes. As discussed in our lecture on the Laplacian, you’ll find many algorithms in digital geometry processing that have this flavor: compute some basic data (e.g., using a local formula at each vertex), solve a Laplace-like equation, compute some more basic data, and so on. this paper, which explains the algorithm in detail. Written exercises for this assignment are found below. and I’m able to arrive at the desired result but I still have the integral over M and the dA—am I doing something wrong where expanding the inner product is part of integrating, or is my expansion of the inner product wrong overall? The “inner product” used in the exercise is the inner product that we talked about in the section on Green’s functions a few weeks ago – it’s defined to be the integral of the dot product of your vectors. That would mean that we would still end up with two integrals, right? One coming from the definition of $E(\phi)$ and one coming from the inner product $\langle \langle X, Y \rangle \rangle = \int_M X \cdot Y dA$? Ah, I see what you’re asking. The inner product inside of the integral in the definition of $E$ is just the regular dot product on vectors (without any more integration). Sorry for the confusing notation. Ah, I understand. Thanks Mark!